I actually started this post almost two weeks ago, on a Saturday morning, and never finished it. I realized it didn't have a very linear storyline and wasn't sure what to do with it. I guess that is actually quite appropriate because it is very telling of life lately...a life that feels more irregular than linear. More jagged than straight. 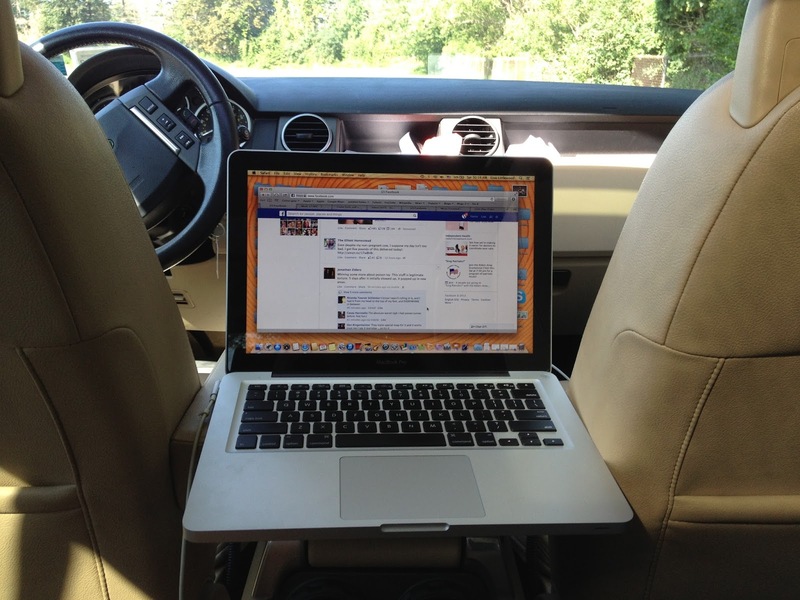 You will probably never guess where I'm sitting and writing this post. No, not in a library, or an office, or even a bedroom. I'm writing this post in the backseat of my car, in the parking lot of a small, local park, next to a dumpster, three blocks from my house. There is a small, unoccupied, wading pool to my left and a long line of trees in front of me. I'm using the car seat base as an office organizer. See how nicely my pens fit in there? 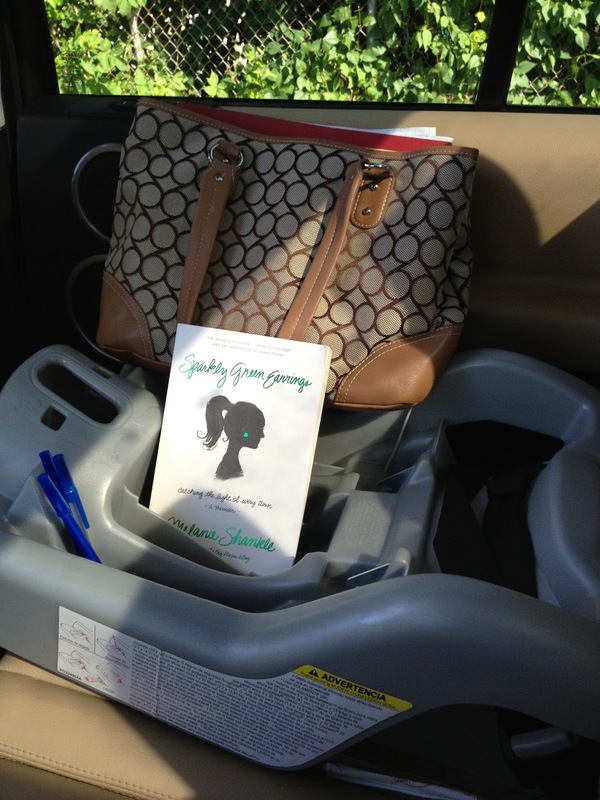 That would be the mommy memoir "Sparkly Green Earrings" sitting there with my pens. It is a hilarious book and just what a tired momma should read at the end of her long days! I guess you could call it my 'getaway car'. As many of you know, finding pockets of time to read, write and scratch notes in my many journals is one of the ways I re-energize. That said, the time and place for said things has been running low lately, you know with the baby nursing around the clock and the girls home from school/preschool all summer. That means momma is a little tired...and sometimes short tempered...and feeling a little bit at the end of her energy/stamina supply. So much so that when I went to Panera the other night to try to find a little bit of quiet I almost gave the lady next to me a dirty look because she was crunching her potato chips so loudly. Don't you know that I just escaped from the zoo...er, um...my house and it is supposed to be QUIET here?! I considered partitioning off a 12 foot radius around me with "warning" tape. Quite frankly, it might have been better for everyone, innocent bystanders included. And so here I am again, at least in a quieter spot this time and with a huge thanks to my incredible husband...He was my knight with shining laptop capabilities this morning. He not only gets kudos for being an awesome and supportive husband, he is my go to tech guy. As I was about to schelp all of my stuff up to the nursery again (computer, pens, paper, books, notebooks, power cords), he gave me a sympathetic looks and said, "Babe, maybe you should get out of here. It might be good to give yourself some distance from....um....all of this...for a while." I was staring at him blankly while still dressed in the black leggings and tank I had worn to bed...I looked down and realized the leggings were on inside out. I glanced around at our perpetually trashed house and nodded my head..."There might be some truth to that." I almost put up a fight because I was not dressed to leave the house (obviously!) and it sounded like too much of a hassle, but he saw the hesitation in my eyes and jumped in to save me. "I'll get you all set up," he responded confidentially. And he did. It was amazing. 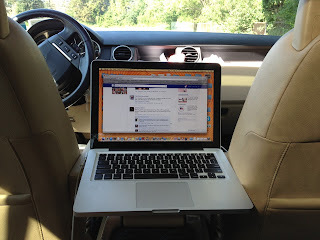 In the two minutes it took me to throw on some shorts and put my contacts in he set up his i-phone as a hotspot (router) in our truck, complete with my laptop, power cord and power source (because my laptop battery was dead (of course)) and had carried my bags out to the car for me. See, knight with shining tech capabilities, isn't he?!! I didn't even know all of that was possible! My prince knew just what I needed. "I'll get you some gas," he said. Next thing I know he's got the gas can from the garage and is pouring it into the car. I started laughing aloud. "Life's an adventure," he said as he topped off my tank. I love my husband. He has great hair. What a wonderful, sweet guy...How romantic that he's filling up my gas tank. Yes, friends, this is what one's life comes too once you've been married for 10 years and have three children. You are turned on not by roses or nice dinners, but your husband who hasn't even brushed his hair putting gas into your gas tank, while you admire him from a distance sans make-up, and sporting your own unbrushed hair. So, why bother sharing all of this? Hi. My name is Lisa and my 3 1/2 month old daughter sleeps in her carseat. Every night. And for every nap. Every day. Perhaps you are a recovering encourager of car seat or swing sleeping too? But guess what? Those said professionals are not the ones trying to get sleep at night...sleep that comes in at least one 8 hour increment when she IS in the car seat and is much more broken up when she is not. Sleep that comes in the form of VERY good naps every day (like 2 hours at a time!) 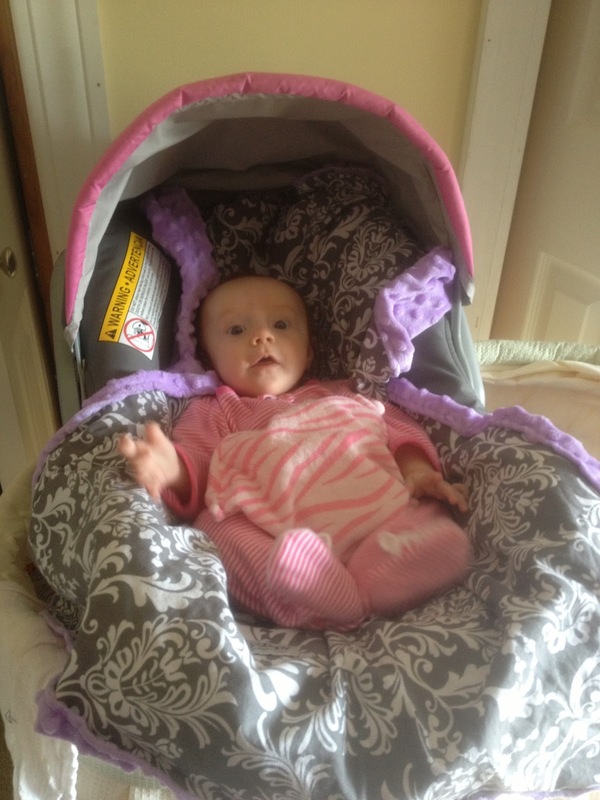 when she is in the car seat and for only 30-45 minutes when she is on her back in the bed or bassinet. I first told myself that I would transition her out of there at 3 months...it didn't pan out so well. Now I'm on the "we'll see how she's doing at 4 months" track. I also googled "car seat sleeping". I mean google has an answer for everything after all and I figured I'd see what the non-professionals had to say. Guess what I found?! 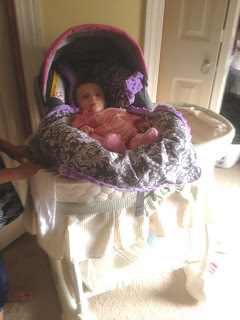 Forum upon forum of parents who...lo and behold...let their own babies sleep in either swings or car seats until they were...you might want to sit down for this...SIX MONTHS OLD! It's crazy...I know. I'm hoping we're not on the trajectory to go on with this silly sleeping method for that long, but if we are, hey, at least we're not alone. All that to say, sometimes a mommas gotta do what a mommas gotta do. I would venture to guess every parent on the planet has a story of some quirky thing they did to either calm their child when they were fussy, or a way to get them to sleep, or methods for getting them to eat...methods that don't seem super...textbook. 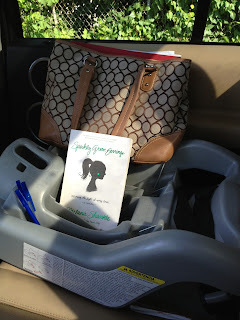 The car seat happens to be our little secret (or not so secret anymore!) method to our madness over here. She just smiles and says, "That's ok! At least she sleeps." Or like when the neighbor kids were over the other day and Ava hollered loudly, "Hey! Want to see where my baby sister sleeps?!" Oh gosh, don't show them that! I think as she drags them into our bedroom. Ava doesn't realize that's not where most babies sleep...in a car seat that is sitting sideways in a bassinet in her parents room. "Oh sure!" they respond enthusiastically, as I cringe inwardly. Apparently they either don't know that that is not where babies are supposed to sleep or they are being very, VERY polite. Either way, it's working for us and I think the whole thing is kind of funny. So much so that I figured I'd even post pictures here so if you are one of the hundreds of parents on that forum I discovered in google wondering if you're totally crazy, you can rest assured (as you are getting your rest at night!) that you are not alone! At least two years have passed since I first read Momma Zen, a book that I immediately added to my favorites list in the treasury of motherhood memoirs read over the last six years. In a moment of inspiration (and quiet! Scott took the girls out of the house which miraculously allows space that I previously thought lost to reopen in my brain!) I grabbed the book off of my bookshelf and went pecking through for a nugget of encouragement for myself and possibly to share in this blog post. I found it...the first page of Chapter 1. I needed go no further than the title, "Other Mothers: Overwhelmed and Uncertain-- There's No Other Kind." I think I exhaled a huge mountain of pent up anxiety that I've been carrying around with me for the last couple of weeks when I read those words this afternoon. Other mothers are overwhelmed?! Really? They are? Suddenly I wanted to give Karen Maezen Miller (the author) a great big hug. That was all the comfort I needed today. That was all I needed to know. Why? Because...and this now feels like a confession at an AMA meeting (that would be Anxious Mother's Anonymous! Oh, you didn't know there was such a group? That's because we're shy about sharing our involvement in the club and our meetings happen haphazardly over coffee or busy playdates when we finally let our guards down to be honest with one another)...I have been feeling a little...ahem...overwhelmed lately. I LOVE my girls. I LOVE my life. But, it's nutty. Especially when all three are home at the same time (which is the case in these summer months). Every time I turn around there are haircuts to be had, and baths to be given, and clothes to be folded, and school supplies or a birthday present to buy, and more grocery shopping to be done, and floors to clean, and water balloons to be picked up from the back patio and wet towels and bathing suits to be washead and a baby to be nursed and changed. And that is just the tip of the iceberg. All of the other needs and requests lay unseen under the surface of the day waiting for us to crash into them and respond accordingly. Maybe it's partially an adjustment to going from two children to three. It feels a little bit like running a marathon over and over and over again, while life with two felt more like running a half marathon over and over and over again in comparison (good grief to those of you with four or five or six! God bless you!!!). Both are challenging and require endurance, but the break comes much sooner when you're running 13 miles as opposed to running 26. There aren't a whole lot of margins these days, or free time and space. When the only kid-free time you have comes at the end of a long day between the hours of 9-11 p.m. you vacillate between wanting to eat an entire bag of potato chips while watching crappy television and wanting to conquer the world...or your house...which you are entirely too tired to do. I usually compromise by eating pretzels and watching slightly better television. They had birthed not just a child but a fully formed ideology of parenthood. It made things look easy...We imagined legions of these super mothers, and we admired them from a distance. Yet privately we despised them. 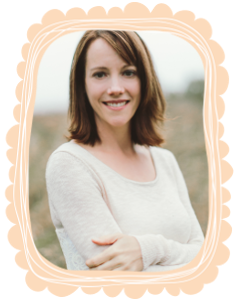 We had been blindsided by how difficult motherhood was...We were the Other Mothers, whose daily blunders and emotional upheavals qualified us for the charter admission into the Other Mothers Club." Oh, I know how she feels!! Yet I always think I'm the only one! The only one that doesn't have it together. That isn't as organized as she'd like to be. That doesn't have the system in place for meal planning and house cleaning and entertaining young children like an event planner on a cruise ship all day long for months on end during the summer. The kids are bored?! Oh no, it's my fault! I'm not being a good mom! The only one who isn't writing her first book of essays on motherhood at night (like I dream about doing during the day, but find myself lured by those salty treats and television after the wee ones are in bed! ), or finding a better way to organize my basement or purging that front closet full of miscellaneous game pieces and last years left over school supplies. Or, doing something else productive like reading classic literature or learning to paint or take better photographs (like I also aspire too, but can't seem to find the energy for!). I'm thankful, in times like these, for books and essays like the one by Miller. 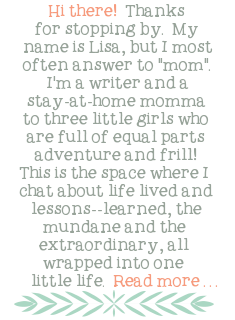 Words by other moms to remind me that I'm not the only one. "Stuck in stroller traffic, I came to suspect that we were all Other Mothers, or rather, that there was no other kind. A lifetime supply of insufficiency arrives with the stretch marks. Moments of self-assurance in motherhood do occur-- joyful, satisfying, and complete-- but they are just moments. In between are long lonely spells where you feel lost and clueless...These gulfs of incomprehension bring the opportunity for spiritual growth and self-acceptance. It is an unexpected gift and not always recognized. That you recognize your gift is my aspiration with these recollections. These words thus flow from my heart to yours, from one other mother to one other mother or mother-to-be. I know. I understand. Me too." If Miller and I are the only ones, then I'm at least comforted to know that I'm not alone. My guess though, is that some of you out there feel the same way we do sometimes. It is why I keep finding quiet moments (which are rarer and rarer these days) to post these honest blog posts, to say, as Miller does...that I know and understand. I've been there too. Hopefully some of you reading this are feeling relieved and glad that you're not the only ones either! 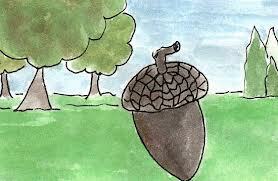 I read a story about an acorn to the girls earlier this week. The story was from a devotional called Thoughts to Make Your Heart Sing by Sally Lloyd Jones (author of The Jesus Storybook Bible, which we love!). The story talked about an acorn being...small. Yet, while it is small, God places the capacity for large things within its little shell. Large things like an entire tree! An entire tree, which produces many more acorns, which fall to the ground and produce many more trees. The summary of the story was that "within this tiny acorn lives an entire forest" all meticulously created by an incredibly creative God. The translation is obvious-- within each of us lies an enormous amount of potential, no matter how big or small we may feel. I love this story. I loved sharing it with the girls. I could see a spark in their eyes about how cool it is that an acorn is capable of all of that. I hope they will remember the story the next time we walk through a wooded park and find acorns along our path. Ironically, while I love to share these stories with my small children and hope they will internalize the lessons and live from the truth of them, I find myself often not believing the same things in my life the older or "bigger" I become. Why is it that when we're small we begin to believe we can do big things and then when we become big we doubt our ability to even make small changes or steps in our lives? I've been thinking about this a lot in my writing, my thinking, my spiritual growth, my growth as a mom. I love life, but I think I've allowed myself to fall into a bit of a rut...a rut that comes with an excuse that sounds like this, "I'm tired and have three kids and the house is always a mess...and...did I mention I'm tired?!!" Haha. Do you have that old record playing in your head too?! This week I'm going to think about the acorns that may be lying dormant in my life. Where is there potential for growth? Where can I tap into God's vast resources for increased inspiration, strength, energy and encouragement? What small seed might there be that I can cultivate into a tree to offer growth for years to come? 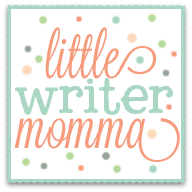 *This post was written in connection with Five Minute Fridays...To join in the fun of writing for five minutes each Friday or to learn more check out her blog. I probably shouldn't kid myself, we DID just bring a baby home three months ago...somehow I subconsciously convinced myself that that wouldn't really change anything...and that all of my brain cells would stay intact. I'm not going to make this long, because it's late and I'm tired and stringing sensible words together these days, especially after 9 p.m., feels about as hard as comprehending quantum physics or neuroscience or something else really, really complicated (I don't know much about either of those things, but they sound really complicated!). Someone once told me that you lose part of your brain with each baby you have. I thought they were joking...until now. Mine feels like it has turned into a hazy pile of mush. I'm hoping I regain some of it back when I start sleeping through the night again, but who knows at this rate! So the girls had swim lessons tonight. They've been taking them once a week and Scott has typically taken them to the lessons because I was attending a book study offered at our church. Aubrey and I would go to the book study, Dad and the girls would go to swim lessons. The book study ended last week and I decided that we should all go to swim lessons tonight...mommy and baby included. Which was a fine idea except that usually I'm the one standing at the door handing the girls their swim bag with their towels and goggles and dry underwear for afterwards, all packed up and ready to go, as everyone heads out the door. So tonight, in the midst of trying to get the baby in her carseat and pack a bag for her, and get my shoes on and everyone else in the car guess what happened? Momma forgot to grab the bag with the goggles and towels and dry underwear because she had a diaper bag over her shoulder. Somehow when you have a diaper bag you feel like you have absolutely everything you need and all else falls to the wayside. We pulled into the parking lot of the middle school where the swim lessons are held and as everyone filed out the door of the car (late, of course!) Scott yelled "grab your bag." "Bag? What bag? Where's the bag?!! Good grief, we make it all the way to swim lessons and we don't have the bag?!" So yes, we sauntered in late without goggles or towels for our children at SWIM PRACTICE. I mean, that's like not having toilet paper in your bathroom, or ice in your freezer, or chocolate chips in your chocolate chip cookies. The girls had a great lesson, got out of the pool shivering and mom stood on the side of the pool with guess what to dry them off? A dry swaddle blanket that I'd been using as a burp cloth. Truth be told it smelled like spit up. "Come here Ella, want me to dry you off with this?" She stares at me like I'm nuts. I am, so I guess that's ok.
"Is Ava going to?" (Is Ava going to let you dry her off with that ridiculousness is what she meant to ask). "Yup, I'm going to dry Ava off with this too." A dry swaddle burp cloth is better than nothing at all when you're dripping with pool water, right? And so I dried her face and her neck and legs...and then Ava's face and neck and legs. With the burp cloth blanket that smelled like spit up. The girls also borrowed goggles from the swim instructor because we had forgotten ours. Apparently goggles borrowed from swim instructors are WAY better than the ones mommy had purchased from the Dollar Store or daddy found on the clarence rack at Wal-Mart. "They were SO good," Ava said. "We could actually see and water didn't get our eyes." "No kidding," I say, nodding my head up and down. So we purchased two new pairs from the instructors at $10 each. "These are professional swim goggles," Dad reported to the girls on the way out to the car. "Like the real, professional swimmers wear." Not the ones who forget their towels and utilize Dollar Store goggles. We're moving into the big time now. And so, after we got home and got everyone showered and to bed Scott said, "See, there is a lesson here-- even mistakes can turn into something good." "You know-- we forgot the bag, but now look at the great goggles the girls have." "Yes, you're absolutely right babe." So now, not only can the girls see more clearly out of their new goggles, but we're seeing things a little more clearly tonight too. And that's about how life goes lately...it feels wild and forgetful and crazy, but we're trying to not make mountains out of molehills, and my husband, who is fortunately more of an optimist than I am, is helping us all see the bright side.